The role of dopamine in sleep-wake regulation is considered as a wakefulness-promoting agent. For the clinical treatment of excessive daytime sleepiness, drugs have been commonly used to increase dopamine release. However, sleep disorders or lack of sleep are related to several dopaminerelated disorders. 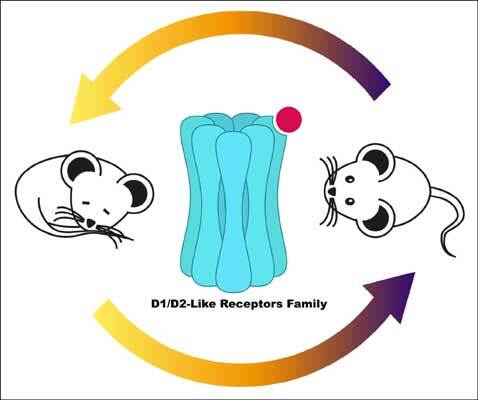 The effects of dopaminergic agents, nevertheless, are mediated by two families of dopamine receptors, D1 and D2-like receptors; the first family increases adenylyl cyclase activity and the second inhibits adenylyl cyclase. For this reason, the dopaminergic agonist effects on sleep-wake cycle are complex. Here, we review the state-of-the-art and discuss the different effects of dopaminergic agonists in sleep-wake states, and propose that these receptors account for the affinity, although not the specificity, of several effects on the sleep-wake cycle. Keywords: Dopamine, dopamine agonist, sleep-wake states, wakefulness-promoting agents, receptors, nuclei. Keywords:Dopamine, dopamine agonist, sleep-wake states, wakefulness-promoting agents, receptors, nuclei. Abstract:The role of dopamine in sleep-wake regulation is considered as a wakefulness-promoting agent. For the clinical treatment of excessive daytime sleepiness, drugs have been commonly used to increase dopamine release. However, sleep disorders or lack of sleep are related to several dopaminerelated disorders. The effects of dopaminergic agents, nevertheless, are mediated by two families of dopamine receptors, D1 and D2-like receptors; the first family increases adenylyl cyclase activity and the second inhibits adenylyl cyclase. For this reason, the dopaminergic agonist effects on sleep-wake cycle are complex. Here, we review the state-of-the-art and discuss the different effects of dopaminergic agonists in sleep-wake states, and propose that these receptors account for the affinity, although not the specificity, of several effects on the sleep-wake cycle.